What is this ID number that shows under Subscriptions? Is it unique to each subscription? Can we make it appear in the email for easy reference? And what does "Last Transaction Id" mean? It doesn't appear to function as a transaction ID search like I thought it would. Sorry for the pain points with the subscription area of the admin. It is something we're looking to improve as we work towards our new administration rebuild. The ID you noted in the subscription summary is the last successful transaction ID related to that subscription. It is unique (in that it's a transaction ID), but it will change every time a subscription renews to be that latest transaction ID. That should hopefully answer your second query as well - but to confirm, the "Last Transaction ID" filter allows you to filter by a specific transaction ID. 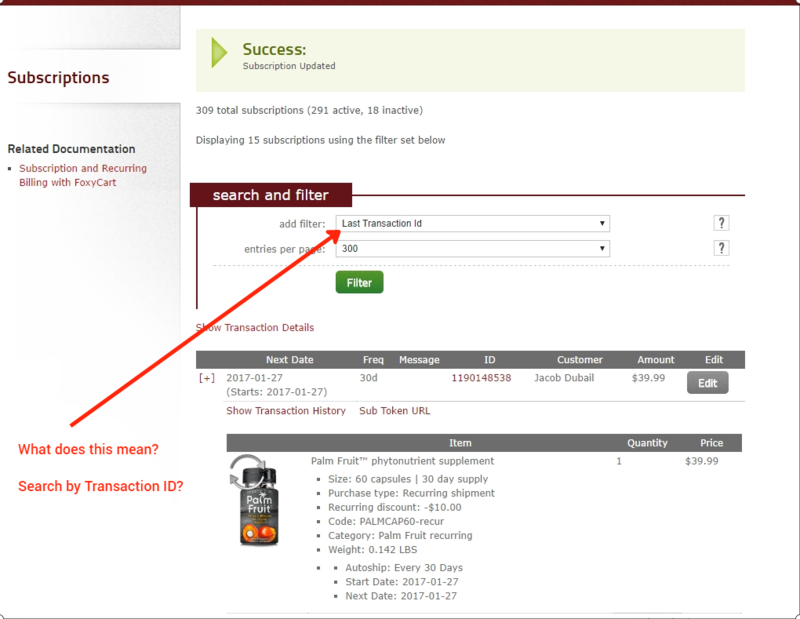 It would need to be the last transaction for a given subscription for it to filter there. Could I confirm with you the connection you're wanting to make? Is it going from an email receipt to viewing the subscription within the FoxyCart administration? If so - you could do that by customer email or customer first or last name, filtering on the subscriptions section. Oh damn. I just realized the ID is the last transaction that actually charged money! Thats why its always been so hard to find these transactions where the subscription has only been modified!